“Gee, it sure would be great to camouflage that green metal box in my yard,” you think to yourself while planning your landscaping project. Wait! That green metal box, called a padmount transformer, is a vital part of your electric service. And there are specific guidelines to follow when planting near them. A padmount transformer is a locked steel cabinet mounted on a concrete pad that contains a securely grounded energized connection for one or more customers. These transformers are used with underground distribution lines at service drops to step down the primary voltage on the line to a lower voltage used in your home. 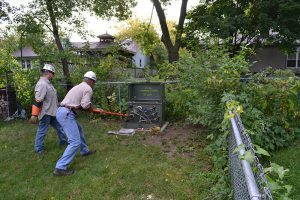 OPPD crew members repair a padmount transformer using a “hot stick.” Proper landscaping around the transformer makes the repair easier. 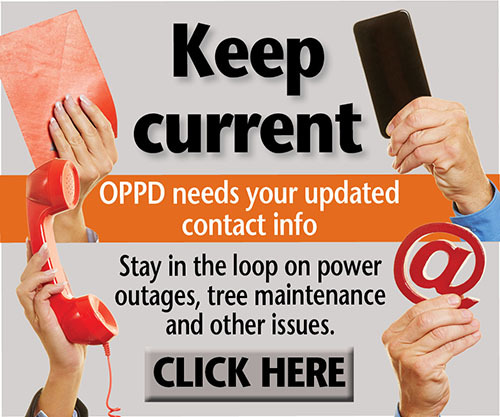 Like most equipment, padmount transformers require periodic maintenance. 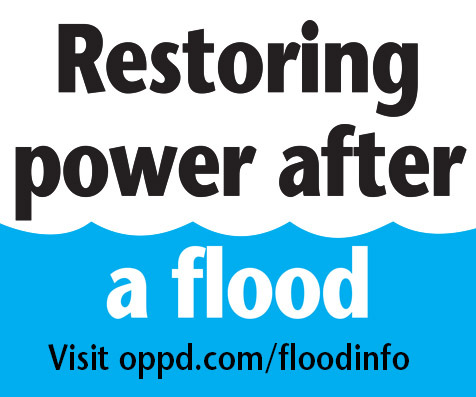 They also may need attention when OPPD crews are working to restore service during a power outage. To that end, in order to work safely on these units, OPPD crews need at least 10 feet of clearance in front of the transformer (the side that is padlocked). They also need three feet of clearance on two sides and at least one foot of clearance on the fourth side. This space is needed because crews use an eight-foot-long “hot stick” to disconnect the power source on padmounts that are energized. The other clearances are needed to perform other repairs. Fences, shrubs and trees located too close to the padmount transformers can slow restoration or create a serious safety hazard. If these items are in the way, crews may have to remove them to gain access. Avoid that situation by taking time to plan before planting shrubs or installing a fence near a padmount. 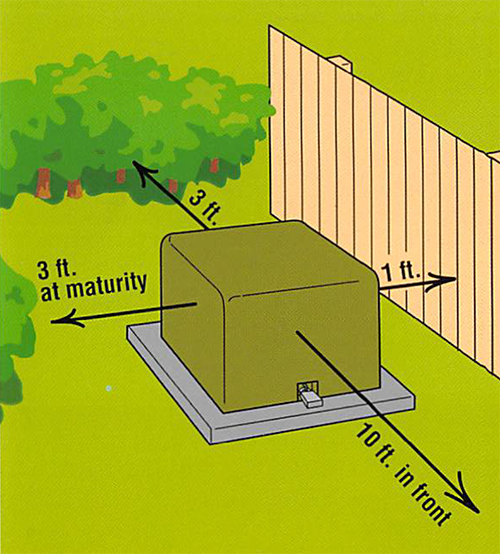 You can place fences near a padmount transformer as long as minimum clearances are met. Just remember to avoid blocking the front side. 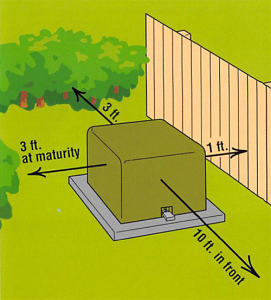 If a fence runs along that side, a gate that swings away from the transformer front must be installed, as shown at left. When planning what to plant near the transformer, consider the mature size and spread of a shrub or tree, which varies by species. This list includes compact varieties of popular shrubs that can be safely planted near a padmount transformer. Thank you for talking about how it is important to know how much clearance your transformer needs in order to work on it properly. It makes sense that keeping them away from plants and other clutter can help you avoid having electrical accidents and make sure you get the job done right. 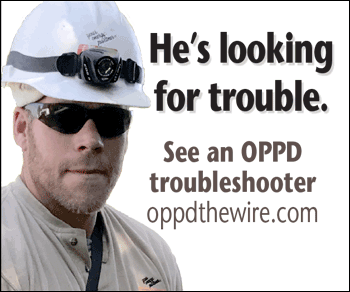 Personally, I would want to make sure I take the time to hire a professional I trust and that have the proper tools and experience to proper,y maintain my electrical transformer.